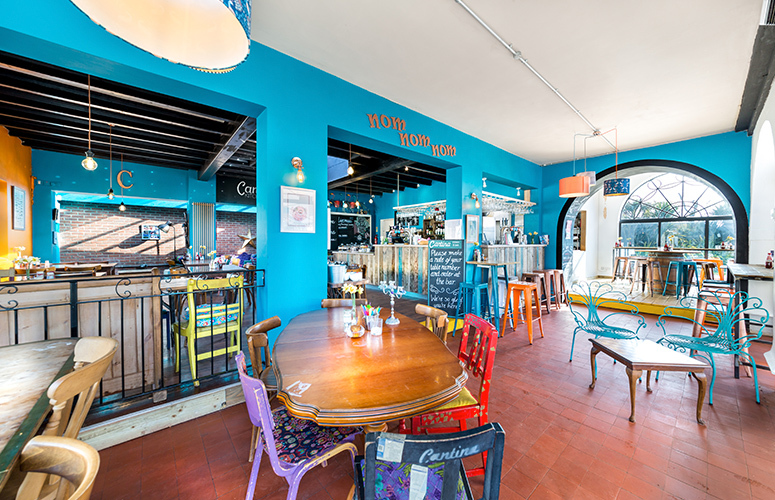 Cantina Kitchen and Bar is situated in the picturesque Youngs Park, right next to Goodrington Beach, Cantina is a vibrant restaurant which offers locally sourced, home cooked food and music in a chilled family and dog-friendly atmosphere. The owners of Cantina have long been friends with our Director, Mark Green. Which meant we were well placed to understand their plans when they approached us to help with the redesign and extension of their premises. We had a strong idea of what we wanted and Fruition were able to help us where we needed it most. They have ensured our style and ethos remains for our customers to enjoy. We look forward to working with them again. The brief was in two stages. 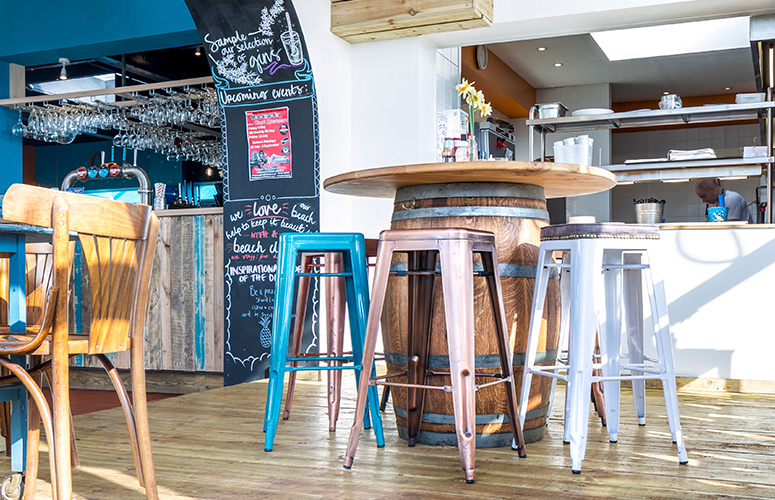 The first focused on increasing the size of the bar and the second was to improve the use of the kitchen so that customers could enjoy a more defined dining experience. 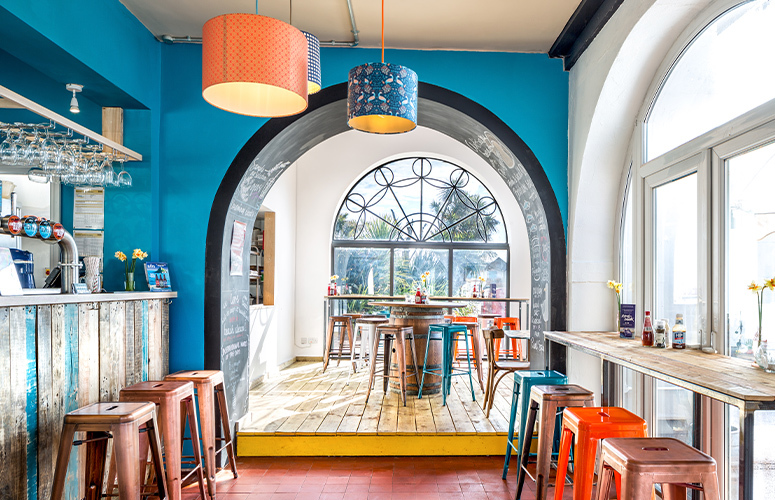 The new layout ensures the fabulous arched windows are central to the design. The kitchen was huge with half of the space unused at the front of the building. This has been opened up to create a fantastic drinking area, open plan to the kitchen, with large glazed doors, bringing the outside in. A metallic paint applied to the feature timber roof and a magnificent chandelier add sparkle and a unique ambience. The bar has been extended to a more versatile L shape, making it a central and prominent feature for both diners and drinkers alike. 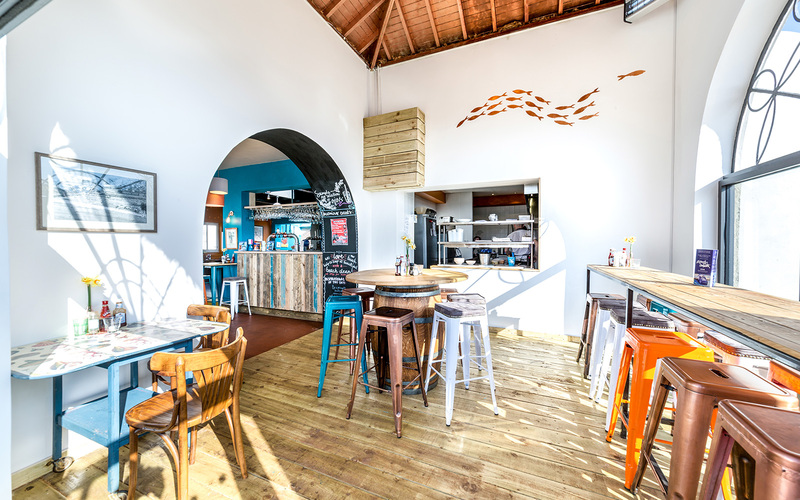 In consultation with the owners, we designed a timber worktop, with recycled cladding at the front of the bar. The existing wooden floor has been re-sanded to bring out the beauty of the natural grain. 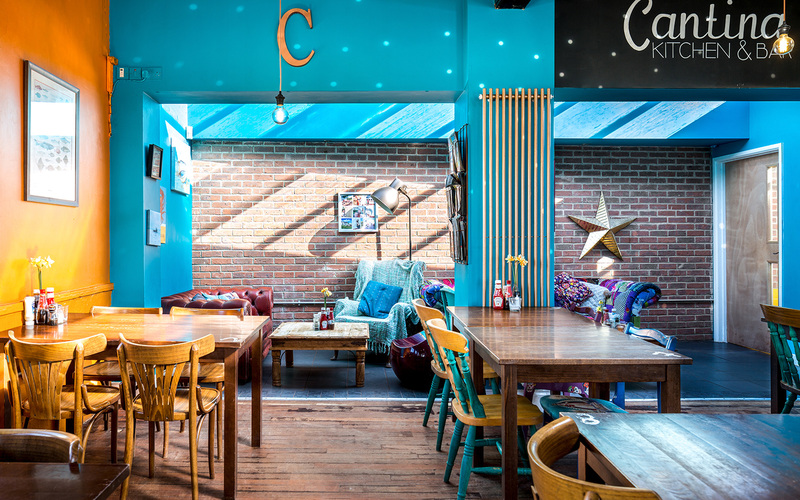 A bright and quirky colour palette of blues and oranges tie in with the furniture, retaining the warm and friendly atmosphere. The back of house has been completely reworked with new staff facilities and much-needed storage and additional customer conveniences, one of which is wheelchair accessible. We were delighted to receive a unanimous planning decision from Torbay Council who approved the second stage of the design. 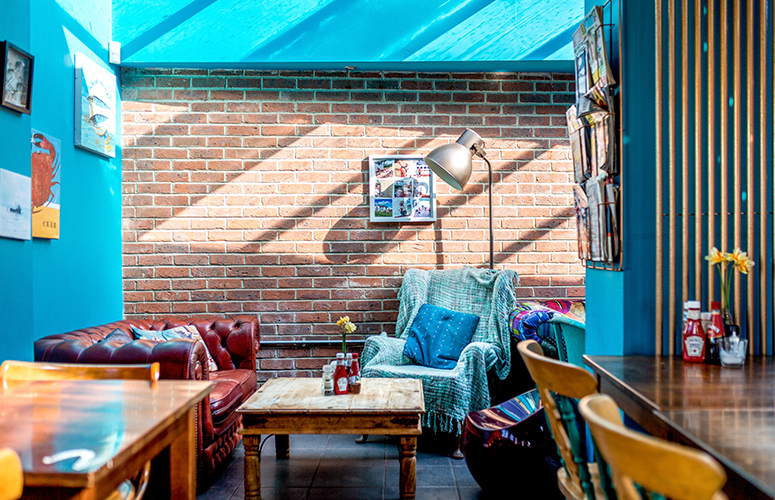 This will see an extension to the existing building, doubling the covers, improving the offer to winter diners, with a new terrace for the warmer months. The front of the new extension will be fully glazed, with roof lights so offering a dining area that will be flooded with light and will afford a view through to the famous window arches. If you would like help with your next project get in touch via our contact page. Our team of experienced interior and graphic designers are always on hand to answer any questions you may have.